Do you know what country has the highest minimum elevation in the world? You’re thinking Nepal, right? Or China. Maybe Afghanistan, Argentina or Chile? 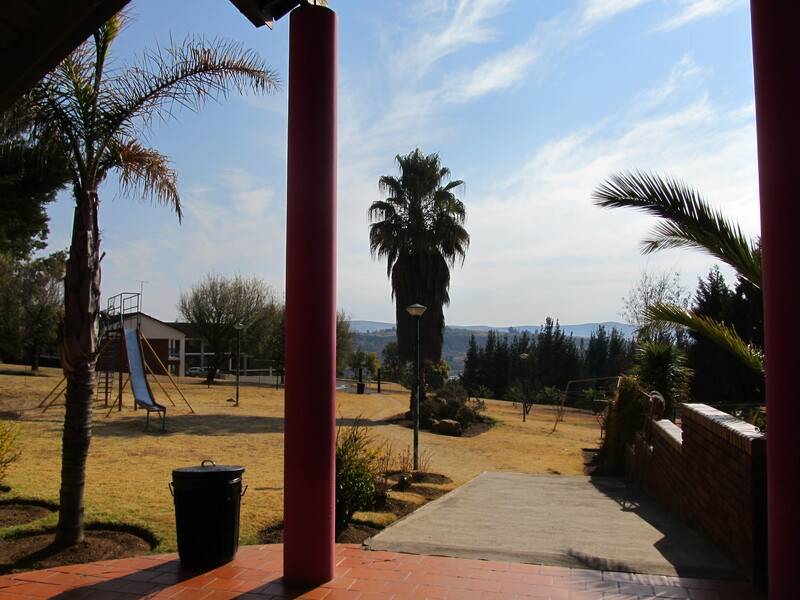 But high in the mountains, surrounded and landlocked by the country of South Africa, is the answer. 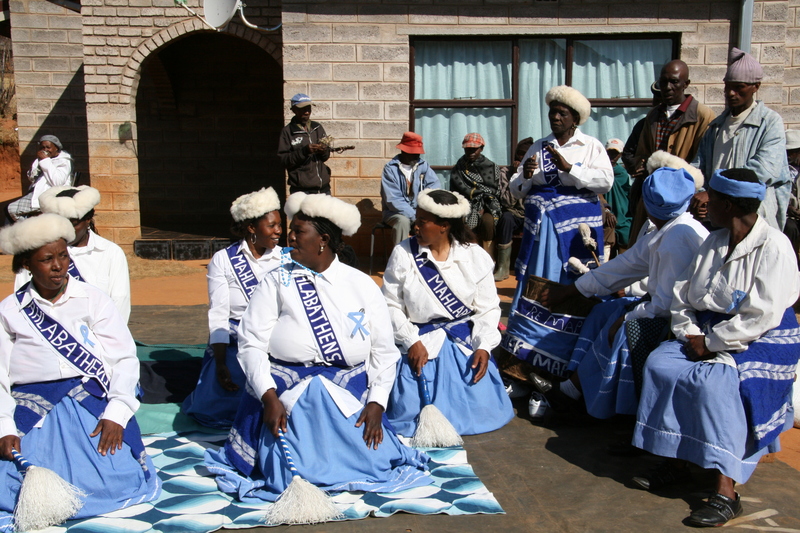 The small country of Lesotho (pronounced “Li-soo-too”) is the only country in the world with a minimum elevation above 1000 meters. 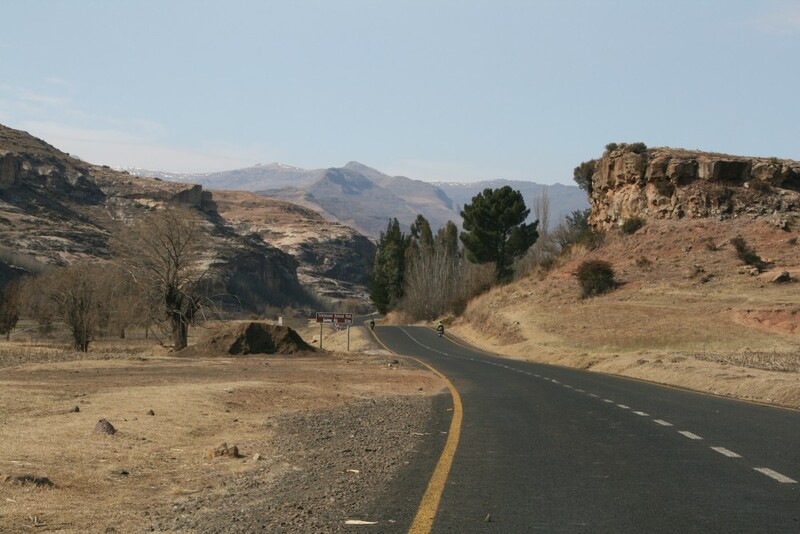 With a low point of 4530 feet, most of Lesotho’s land is above 6000 feet. We spent only 2 days in Lesotho, a country with just under 2 million people, about a quarter of whom have AIDS, and a land of 11,720 square miles, slightly smaller than the U.S. state of Maryland. Skiing, hiking, camping, dramatic views, harrowing car rides and pony treks, round huts, friendly and very poor people, donkeys and mountains: Lesotho offers a variety of excitement for the adventuresome traveler. There is so much of the country we didn’t see, and there are so many places I wanted to go but didn’t. So for those of you who have more time and interest or whose travel plans allow a variation off the beaten track, here are the places we didn’t go. If you go, please let me know, so I can travel again to this beautiful country and live vicariously through your adventures. 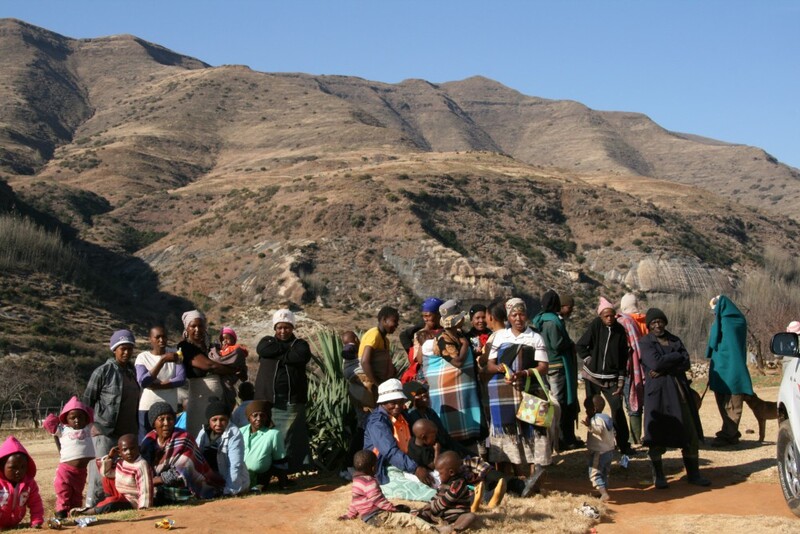 Experience traditional Besotho life at Malelea Lodge and Pony Trekking Centre, a backpackers lodge in Western Lesotho. Hike and bathe in river pools in Ts’ehlanyane National Park and stay at Maliba Mountain Lodge. Visit Semonkong Lodge and you can hike to the mighty Maletsunyane Falls, where water plummets 186 meters in one of the highest single dropping waterfalls in Africa. Drive the treacherous, dramatic and beautiful Sani Pass and visit the highest pub in Africa at the Sani Top Chalet. 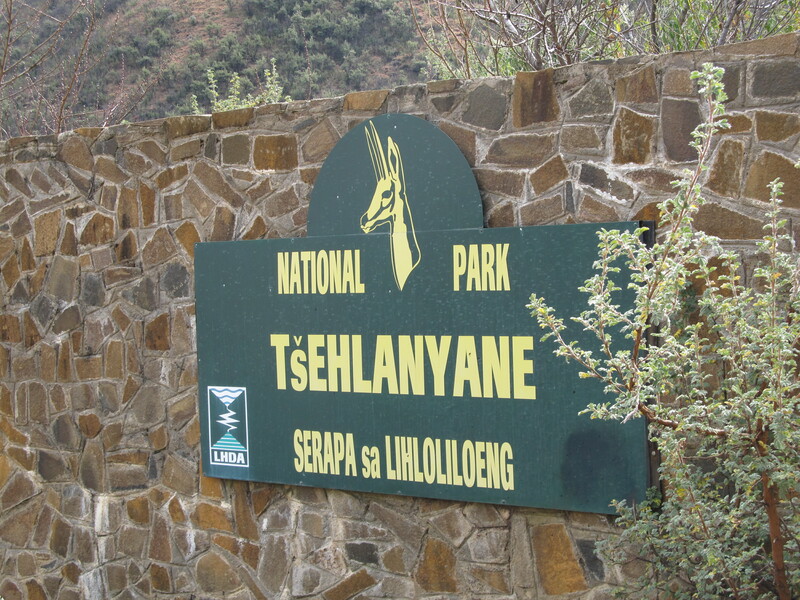 Hike southern Africa’s highest peak, Thabana-Ntlenyana (3482m). Go skiing in Lesotho at AfriSki Resort . 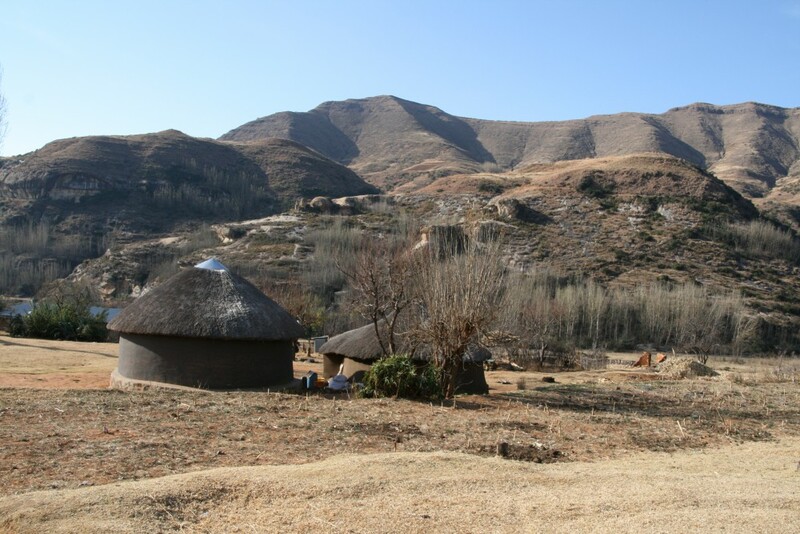 Experience a rural stay in the Northern mountains of Lesotho at Mamohase Rural Stay B&B. 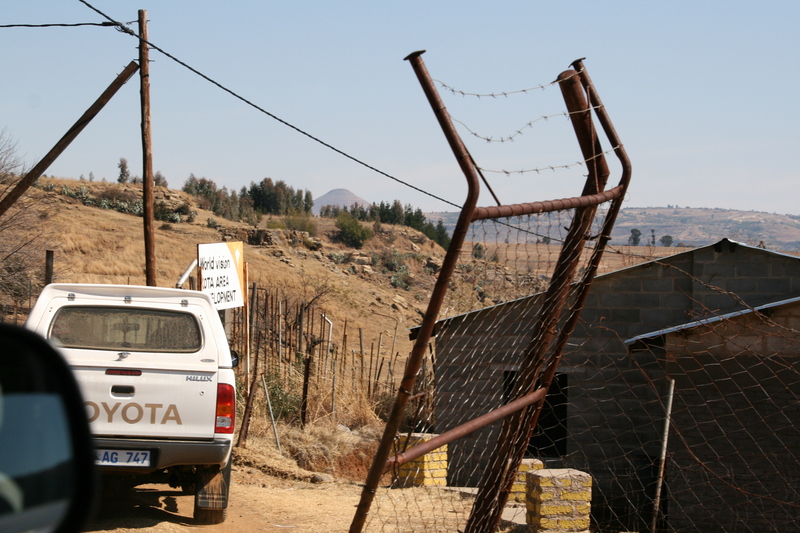 For convenience and simplicity, we spent our one night in Lesotho in a gated business hotel where we were able to leave our car for the day and sleep easily at night. 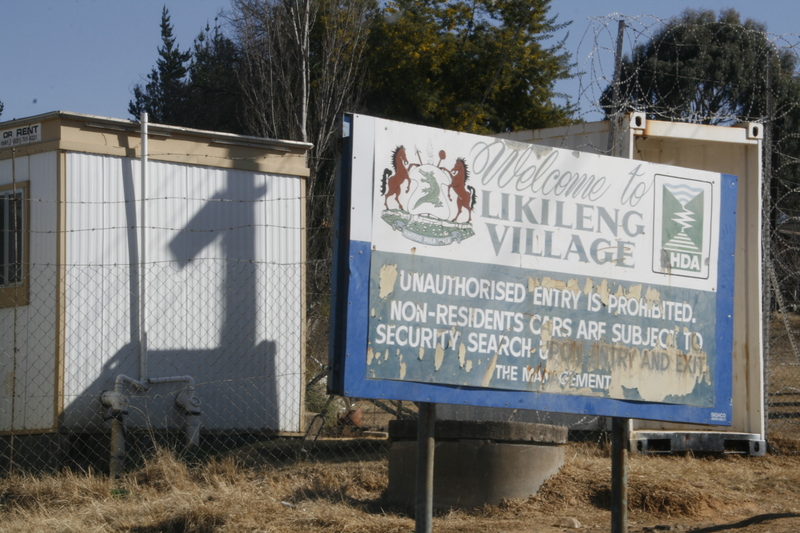 With a motel-like setup, the Likileng Lodge located near the Caldenspoort border just outside of Butha Buthe, was a little worn but clean and perfect for our stay. Because the rooms each contained only two double beds, our family was forced to split up, so in each room slept one adult and one child, one male and one female. As we registered, I stepped forward to sign the endless paperwork for the second room but was waved away. The man at the desk wanted the other man in our party besides my husband, our 15-year old son, to sign for the room. We realized later that our American nutrition caused him to look much older than the malnourished children of Lesotho. I had to swallow my pride and my words, as this man at the front desk obviously didn’t think much of women or perhaps his culture didn’t allow him to be friendly to a married woman, in either case, I was quiet, not wanting to offend in a country where I did not speak their language. 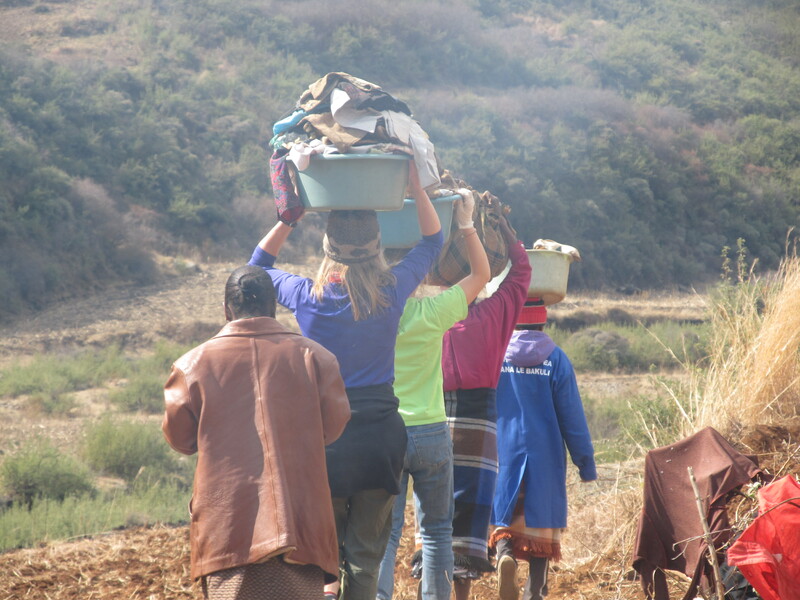 I was apprehensive about our trip to Lesotho, not knowing what the food would be like, not knowing how I would communicate the need to eat gluten free in a language I didn’t speak. Every time I spoke to someone at World Vision by phone or in emails, I emphasized the need for my daughter to eat gluten free. The last thing I wanted to do was offend the family of our sponsored child as they fed us a meal. On the other hand, I didn’t want my daughter to get sick! Later that evening, we experienced our second Lesotho culinary experience while eating at our hotel’s restaurant in Butha Buthe. Accompanied by simple green salad and rice, we had a choice of chicken, T-bone steak, or rump roast. The meat was prepared simply, the chicken stir fried with peri peri spices and served with peach chutney. 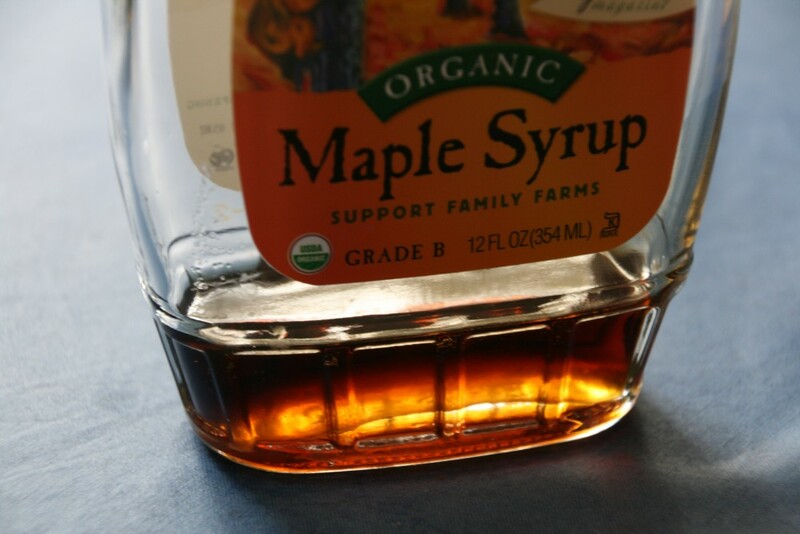 Delicious and gluten free. For breakfast at the hotel the next morning, we ate a traditional English style breakfast with cereal, yogurt, fruit and bread to start followed by eggs cooked to order, bacon and stewed tomatoes. Lunch the next day included chicken, beet salad, coleslaw, mashed potatoes and pineapple Fanta. 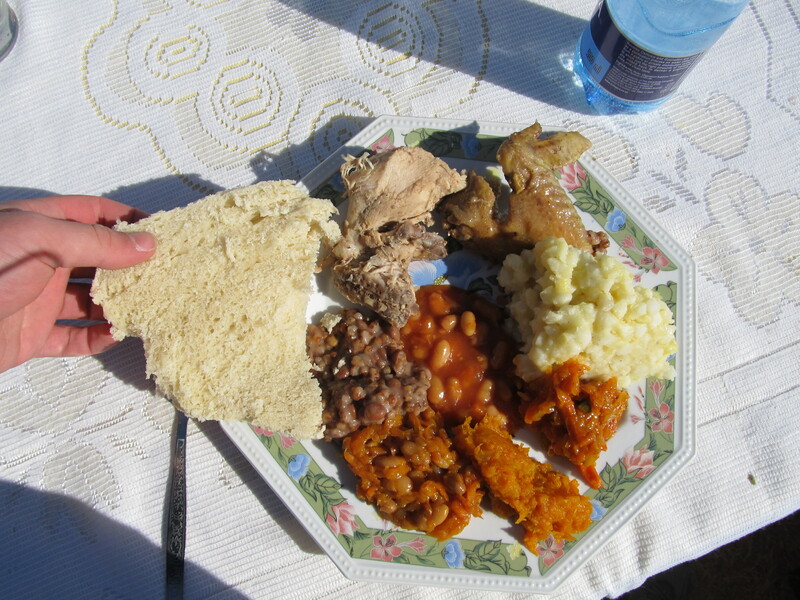 Avoiding gluten in Lesotho was easy, especially since wheat is not a traditional staple, but trusting in people and their understanding of our dietary restrictions was important for our peace of mind as well as the health and comfort of our daughter. 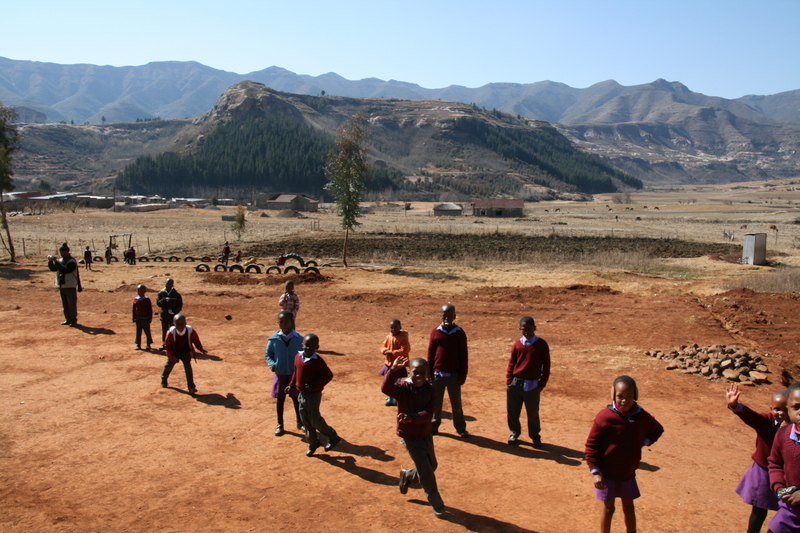 Orphans are common in Lesotho, largely due to the high incidence of AIDS. We volunteered to spend a day of service with World Vision, and our day was spent helping a family of orphans. 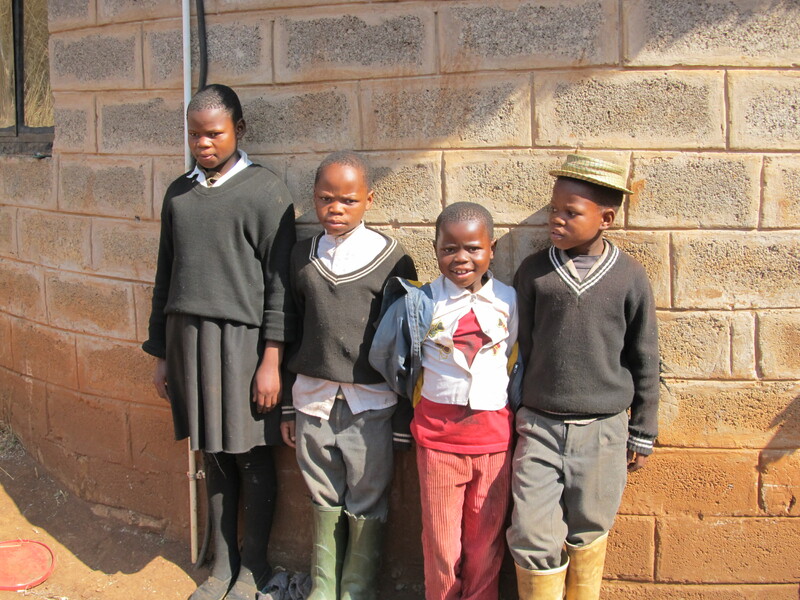 Living alone in a small village about a 10-minute drive from our sponsored child and not too far from Ts’ehlanyane National Park, were four children: a 15-year old girl, 12-year old twin boys, and an 8-year old girl. 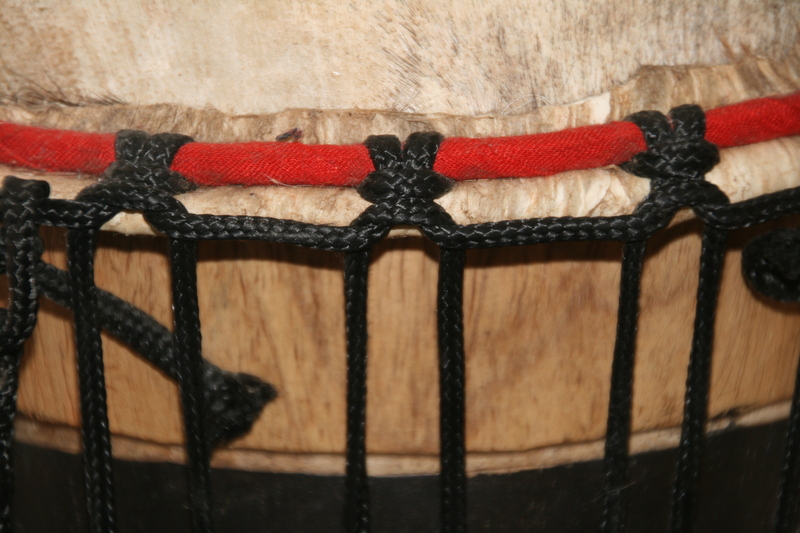 (Their brother, 18 years old, was off on an initiation program for 6 to 8 months.) 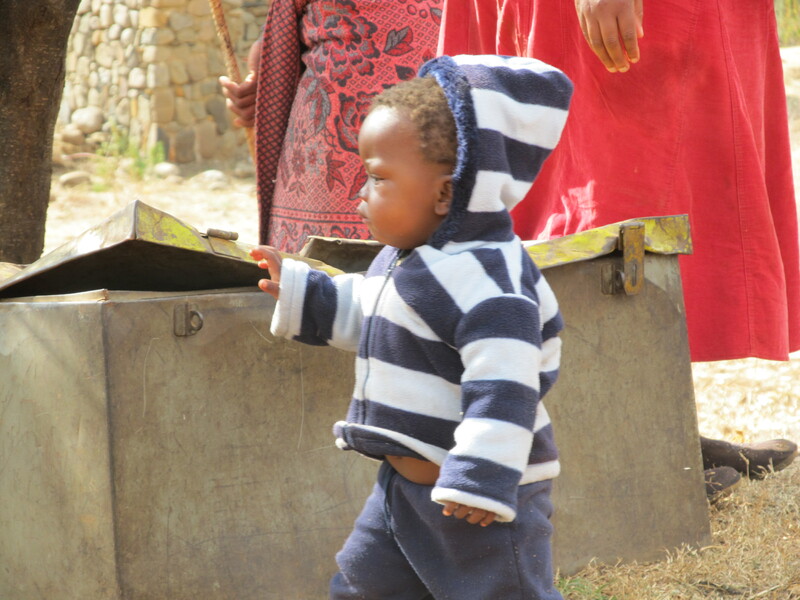 According to Julius, our translator, there is much child abuse in Lesotho and advantages taken of children, even by family members. The neighbors watch out for these children but have little food themselves. With World Vision employees and other community volunteers, we spent the day cleaning the children’s space, their hut, their clothes and the land around them. Because of the cold, we didn’t meet until 11 a.m. when the land was warmed by the sun. When we arrived, the hut the children share was surrounded by trash. 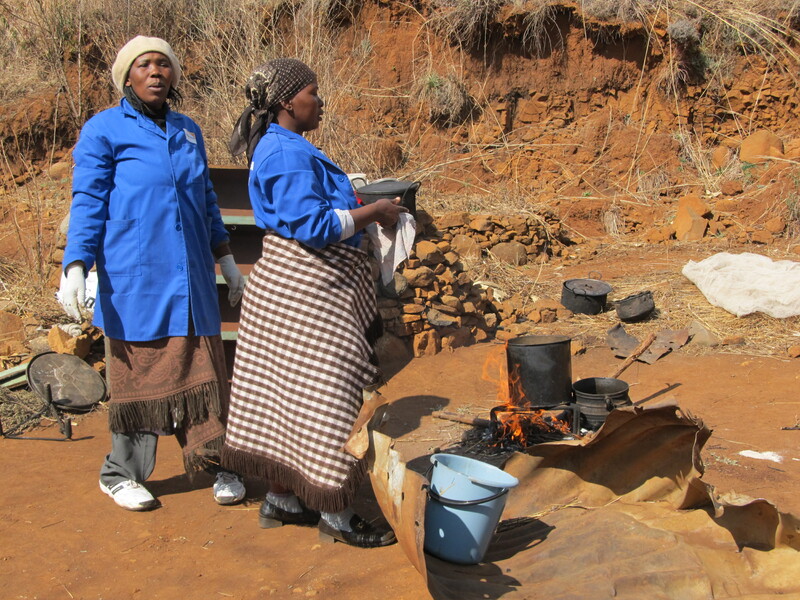 Inside, the brick rondavel with straw roof and dung floor contained a shelf, a trunk for clothes and a twin bed with a rusty frame and broken springs. My husband cut and gathered fire wood. 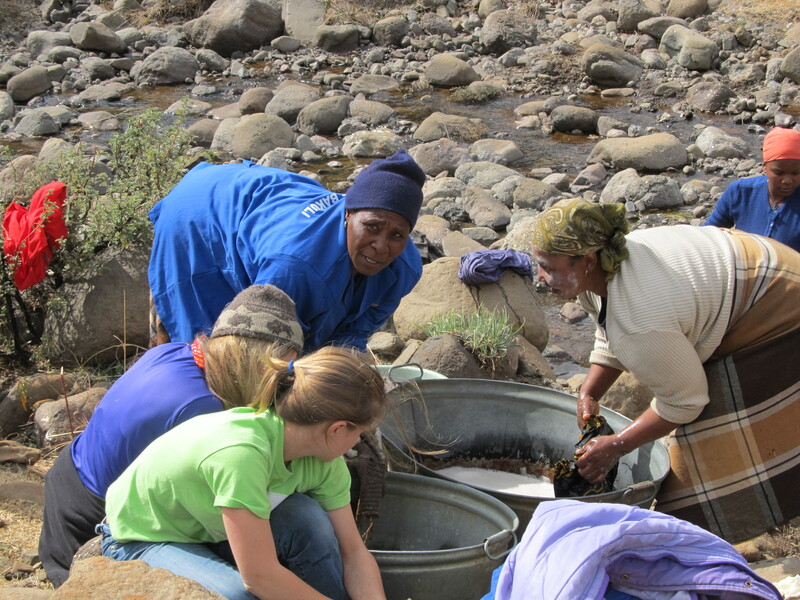 My children and I picked up trash, my husband and son washed dishes and cleaned the hut’s soot-covered ceiling while my daughter and I washed the children’s clothes (see related post “Washing Clothes by the River in Lesotho“). Just off the road, the hut is vulnerable to litter from cars driving by. We found bits of old shoes, wrappers, bottles, broken glass and plastic, a film canister, old workbooks, fabric, a metal spoon. I gave the plastic alphabet stencil to a grandmother who sang the ABCs to the child (in English) on her lap and pointed to the letters. The clothes, the ceiling, and the dishes were filthy and required much scrubbing. Between jobs, we played Frisbee and laughed with the three youngest orphans. 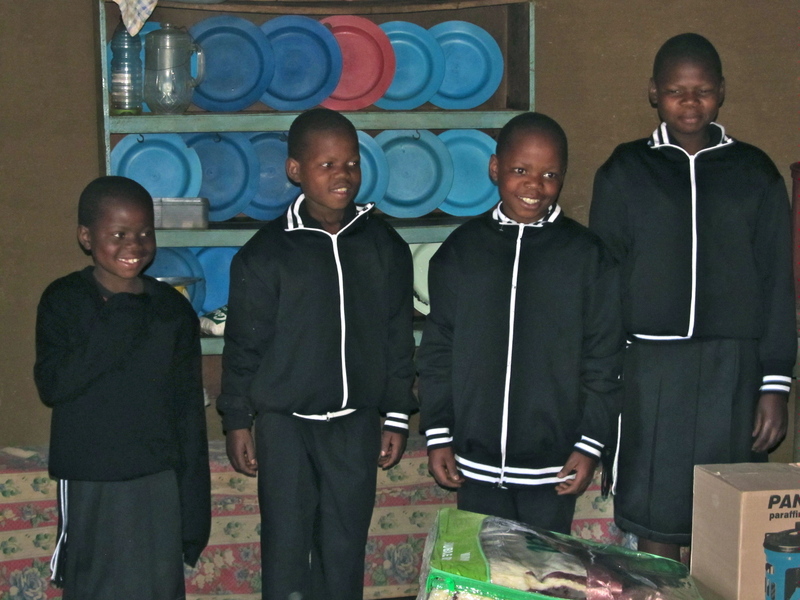 When our job was done, we gathered together inside the hut where World Vision supplied the children with new school uniforms, two new mattresses, four comforters, eggs, beans, sacks of maize and a lock for the door. 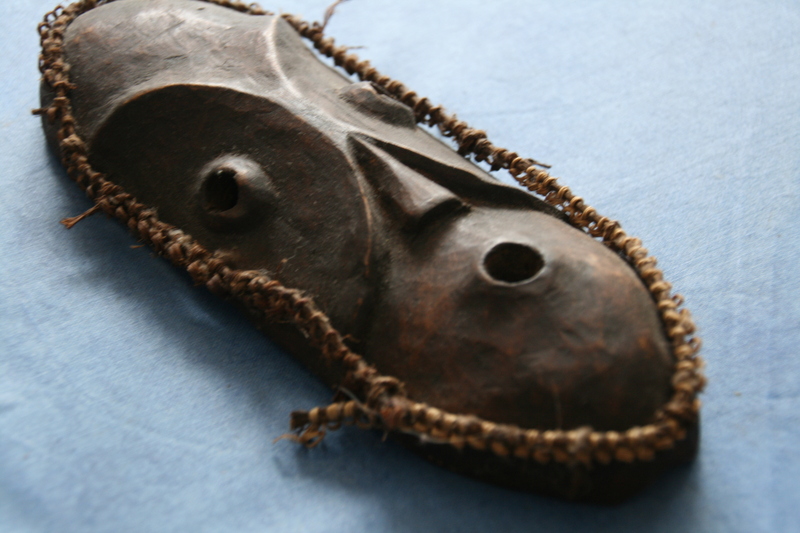 As the 30 or so community workers gathered in the hut, they sang a song and although we didn’t know its meaning, it evoked powerful emotions in all of us. One of the World Vision workers wiped away a tear as she lectured to the group. She said that we (the Americans) were not just rich but that we love the children and are asking the community to watch them. She said that it is the responsibility of everyone in the community to look after and take care of the children and reminded them that they would want the community to take care of their children if they died. 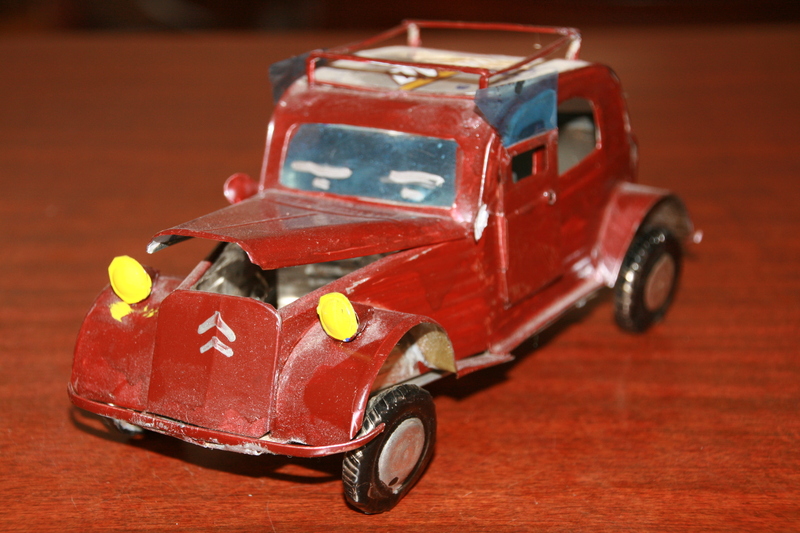 After my husband said a few words and gave each of the children a small toy, lunch was served to all the workers. We ate before returning to our hotel, saying good-bye to Julius and Lesotho and crossing the border back into South Africa.